Ms. Zonia C. Salazar, Supervising Statistical Specialist of PSA-RSSO 8; Ms. Mae R. Almonte, Chief Statistical Specialist of PSA-RSSO 8 SOCD; First Placer JB Hariz B. Alido; Second Placer Narciso Aljun S. Cemanes; Third Placer Fritz A. Dapdap; Ms. Thea C. Galos, Director of EVSU-UQAAC; and Ms. Hanna Rachel A. Gohil, Instructor I of EVSU. TACLOBAN CITY – Three males bagged the highest awards in the first ever Data Cartooning Contest in Eastern Visayas organized by the Philippine Statistics Authority - Regional Statistical Services Office VIII (PSA-RSSO8), in collaboration with the Eastern Visayas State University (EVSU) and the Philippine Statistical Association, Inc. - Region VIII Chapter (PSAI-Region 8) last Friday, 15 February 2019, at the Eastern Visayas State University Engineering Building. Among the 13 BS Statistics and BS Math students from EVSU, JB Hariz B. Alido was awarded first place. Completing the top three winners were Narciso Aljun S. Cemanes - second place, and Fritz A. Dapdap - third place. Winners were awarded with cash prize, certificate, and USB flash drive. Data cartooning is illustrating data concisely into a visually appealing and informative picture. It is one of the most exciting ways to express insights and knowledge in interpreting data by sketching or drawing comical images. The objective of this activity is to encourage the youth to express their views on the importance of statistics, to appreciate the vital statistics generated by the PSA from the civil registry documents, and likewise to promote the importance of civil registration in the lives of every Filipino. 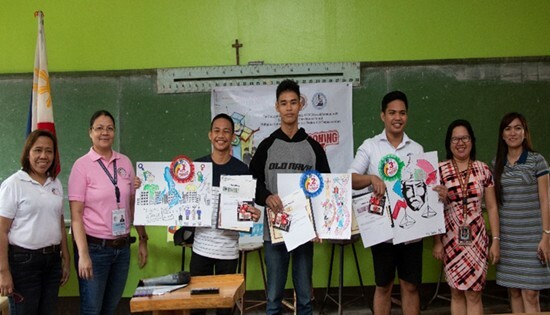 The first ever Data Cartooning Contest is one of the activities of PSA-RSSO 8 in celebration of the 2019 Civil Registration Month with the theme, “Inclusive and Responsive Civil Registration and Vital Statistics (CRVS): Working Smarter Through Innovation”, and also in support to the 112th Founding Anniversary of the EVSU. This contest was conducted as a dry run in preparation for the First Regional Data Festival in November 2019. Ms. Mae R. Almonte, Chief Statistical Specialist of PSA-RSSO 8 Statistical Operations and Coordination Division (SOCD); Ms. Thea C. Galos, Director of EVSU - University Quality Assurance and Accreditation Center (UQAAC); IDr Alejo G. Surpia, Instructor I of EVSU; and IDr Aaron M. Rebato, Instructor I of EVSU, sat as board of judges. Criteria of the competition included, originality/uniqueness (20 points), relevance and implications (30 points), visual quality and creativity (30 points), and accuracy of data presented (20 points).